Occupy Wall Street and the hundreds of occupations it has sparked nationwide are among the most inspiring events in the U.S. in the 21st century. The occupations have brought together people to talk, occupy, and organize in new and exciting ways. The convergence of so many people with so many concerns has naturally created tensions within the occupation movement. One of the most significant tensions has been over race. This is not unusual, given the racial history of the United States. But this tension is particularly dangerous, for unless it is confronted, we cannot build the 99%. The key obstacle to building the 99% is left colorblindness, and the key to overcoming it is to put the struggles of communities of color at the center of this movement. It is the difference between a free world and the continued dominance of the 1%. Left colorblindness is the belief that race is a “divisive” issue among the 99%, so we should instead focus on problems that “everyone” shares. According to this argument, the movement is for everyone, and people of color should join it rather than attack it. Left colorblindness claims to be inclusive, but it is actually just another way to keep whites’ interests at the forefront. It tells people of color to join “our” struggle (who makes up this “our,” anyway?) but warns them not to bring their “special” concerns into it. It enables white people to decide which issues are for the 99% and which ones are “too narrow.” It’s another way for whites to expect and insist on favored treatment, even in a democratic movement. As long as left colorblindness dominates our movement, there will be no 99%. There will instead be a handful of whites claiming to speak for everyone. When people of color have to enter a movement on white people’s terms rather than their own, that’s not the 99%. That’s white democracy. Biologically speaking, there’s no such thing as race. As hard as they’ve tried, scientists have never been able to define it. That’s because race is a human creation, not a fact of nature. Like money, it only exists because people accept it as “real.” Races exist because humans invented them. Why would people invent race? Race was created in America in the late 1600s in order to preserve the land and power of the wealthy. Rich planters in Virginia feared what might happen if indigenous tribes, slaves, and indentured servants united and overthrew them. So, they cut a deal with the poor English colonists. The planters gave the English poor certain rights and privileges denied to all persons of African and Native American descent: the right to never be enslaved, to free speech and assembly, to move about without a pass, to marry without upper-class permission, to change jobs, to acquire property, and to bear arms. In exchange, the English poor agreed to respect the property of the rich, help them seize indigenous lands, and enforce slavery. This cross-class alliance between the rich and the English poor came to be known as the “white race.” By accepting preferential treatment in an economic system that exploited their labor, too, the white working class tied their wagon to the elite rather than the rest of humanity. This devil’s bargain has undermined freedom and democracy in the U.S. ever since. As this white race expanded to include other European ethnicities, the result was a very curious political system: the white democracy. The white democracy has two contradictory aspects to it. On the one hand, all whites are considered equal (even as the poor are subordinated to the rich and women are subordinated to men). On the other, every white person is considered superior to every person of color. It’s democracy for white folks, but tyranny for everyone else. In this system, whites praised freedom, equal opportunity, and hard work, while at the same time insisting on higher wages, access to the best jobs, to be the first hired and the last fired at the workplace, full enjoyment of civil rights, the right to send their kids to the best schools, to live in the nicest neighborhoods, and to enjoy decent treatment by the police. In exchange for these “public and psychological wages,” as W.E.B. Du Bois called them, whites agreed to enforce slavery, segregation, reservation, genocide, and other forms of discrimination. The tragedy of the white democracy is that it oppressed working class whites as well as people of color, because with the working class bitterly divided, the elites could rule easily. The white democracy exists today. Take any social indicator—rates for college graduation, homeownership, median family wealth, incarceration, life expectancy, infant mortality, cancer, unemployment, median family debt, etc.—and you’ll find the same thing: whites as a group are significantly better off than any other racial group. Of course there are individual exceptions, but as a group whites enjoy more wealth, less debt, more education, less imprisonment, more health care, less illness, more safety, less crime, better treatment by the police, and less police brutality than any other group. Some whisper that this is because whites have a better work ethic. But history tells us that the white democracy, born in the 1600s, lives on. The roots of left colorblindness lie in the white democracy and the distorted mindset it creates. It encourages whites to think that their issues are “universal” while those of people of color are “specific.” But that is exactly backwards. The struggles of people of color are the problems that everyone shares. Anyone in the occupy movement who has been treated brutally by the police has to know that Black communities are terrorized by cops every day. Anyone who is unemployed has to know that Black unemployment rates are always at least double that of whites, and Native American unemployment rates are far higher. Anyone who is sick and lacks healthcare has to know that people of color are the least likely to be insured (regardless of their income) and have the highest infant mortality and cancer rates and the lowest life expectancy rates. Anyone who is drowning in debt should know that the median net wealth of Black households is twenty times less than that of white households. Only left colorblindness can lead us to ignore these facts. This is the sinister impact of white democracy on our movements. It encourages a mindset that insists that racial issues are “divisive” when they are at the absolute center of everything we are fighting for. 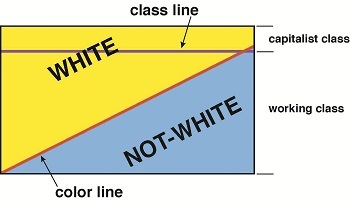 To defeat left colorblindness and the distorted white mindset, we must come to see any form of favoritism toward whites (whether explicit or implicit) as an evil attempt to perpetuate the cross-class alliance rather than build the 99%. Throughout American history, attacking the white democracy has always opened up radical possibilities for all people. The abolitionist movement not only overthrew slavery, it kicked off the women’s rights and labor movements. The civil rights struggle not only overthrew legal segregation, it kicked off the women’s rights, free speech, student, queer, Chicano, Puerto Rican, and American Indian movements. When the pillars of the white democracy tremble, everything is possible. The only thing that can stop us is us. What prevents the 99% from organizing the world as we see fit is not the 1%. The 1% cannot hold on to power if we decide they shouldn’t. What keeps us from building the new world in our hearts are the divisions among us. Our diversity is our strength. But left colorblindness is a rejection of diversity. It is an effort to keep white interests at the center of the movement even as the movement claims to be open to all. Urging us to “get over” so-called “divisive” issues like race sound inclusive, but they are really efforts to maintain the white democracy. It’s like Wall Street executives telling us to “get beyond” “divisive” issues like their unfair profits because if you work hard enough, you too can get a job on Wall Street someday! Creating a 99% requires putting the struggles of people of color at the center of our conversations and demands rather than relegating them to the margins. To fight against school segregation, colonization, redlining, and anti-immigrant attacks is to fight against everything Wall Street stands for, everything the Tea Party stands for, everything this government stands for. It is to fight against the white democracy, which stands at the path to a free society like a troll at the bridge. While no pamphlet can capture everything a nationwide movement can or should do to undermine the white democracy and left colorblindness, below is a short list of questions people might consider asking in movement debates. These questions were developed from actual debates in occupations throughout the U.S.
-Do speakers urge us “get beyond” race? Are they defensive and dismissive of demands for racial justice? -If speakers urge developing “close working relationships with the police,” do they consider how police terrorize Black, Latino, Native, and undocumented communities? Do they consider how police have attacked occupation encampments? -If speakers urge us to hold banks accountable, do they encourage us to focus on redlining, predatory lending, and subprime mortgages, which have decimated Black and Latino neighborhoods? -If speakers urge the cancellation of debts, do they mean for things like electric and heating bills as well as home mortgages and college loans? -If speakers urge the halting of foreclosures, do they acknowledge that they take place primarily in segregated neighborhoods, and do they propose to start there? -If speakers urge the creation of more jobs, do they acknowledge that many communities of color have already been in chronic “recessions” for decades, and do they propose to start from there? Attack capitalist power—attack the white democracy. People of color at the center!